While David studied hard for his Master Electrician's exam (which he passed, by the way ... yahoo! ), I was charged with the responsibility of finding fun and interesting things to do here in Virginia once the exam was over and we had some free time on the weekends. Oh, darn … I have to do everything around here! We've put off several boat projects and maintenance while David was studying which we intend to handle on weekdays, leaving weekends open for exploration. Besides, it's just too cold for any boat trips at the moment. First off, I discovered that Enterprise offers special weekend rates of $9.99/day on rental cars. For us that totals $33.46 with tax for 3 days of not walking and being able explore beyond our 10-mile round-trip walking radius. I booked cars for several weekends in a row and this past weekend was the first of four that we'll spend discovering a bit more about Virginia. Since we are limited to 300 free miles/weekend, the trips I planned will not exceed 250 miles total, thus allowing the remaining 50 miles to be used for errands like provisioning and trips to hardware stores and chandleries for boat parts … and Trader Joe's for wine. Historic Jamestowne is administered jointly by the National Park Service (NPS) and Preservation Virginia, a group “committed to supporting preservation, education, and the archaeological investigation of Historic Jamestowne, the original site of the first permanent English settlement in America.” We're talking Captain John Smith and Pocahontas in the early 1600s and it all seemed to come alive as we walked the same grounds that these early colonists walked over 400 years ago. While planning the route using a Maps app on our iPhone, I noted that several routes required tolls (Bah!) and one took a little longer without tolls, but required a ferry. A ferry? After a little research, I found it was a free (yes, free!) ferry operated by the Virginia Department of Transportation on a very convenient schedule. What the heck … let's ride the ferry. There was virtually no wait to board mid-morning on a chilly Saturday and the ride across the river though brisk, was smooth and lasted about 15 minutes, depositing us within a stone's throw of the national park. Historic Jamestowne is located on James Island and accessed via a paved road over an isthmus extending from the mainland. Our first stop, even before the Visitor Center, was the Glass House. The early colonists were charged with making money for their benefactors and the Crown. Glass production was one of their first endeavors and archaeological digs have unearthed the remains of several furnaces used by the early glassblowers. The NPS has constructed an interpretive center, complete with glassblowing demonstrations. They offer a 4-year apprenticeship at the facility where bottles, vases, pitchers and other glass objects are created and sold. Apprentice glassblower at Historic Jamestowne Glasshouse exhibit. At the Visitor Center, we watched an orientation movie then began exploring the 22+-acre historical site on foot. The day was bright and sunny with an cloudless blue sky and chilly temps in low 40s. With a park map to guide us, we headed toward the Tercentenary Monument erected in 1907 to commemorate Jamestown's 300th anniversary. Tercentenary Monument erected in 1907 for Jamestown's 300th anniversary. From the monument, we followed paths past a rather stylized bronze statue of Pocahontas. The story of Pocahontas' later years is not a pleasant one. She was married to a native American, kidnapped by the colonists, converted to Christianity, ended up married to John Rolfe and finally died of disease in England. The only known image of Pocahontas shows a vastly different, “civilized” woman. The only known image of Pocahontas and her statue at Historic Jamestowne. The site of the original Jamestown settlement is an ongoing archaeological dig with significant excavation in progress. The foundations of a fort, barracks, houses, warehouses and even a tavern are visible and are part of the current projects. Archaeologists have unearthed foundations from the original Jamestowne settlement. No visit to Jamestown would be complete without viewing the Captain John Smith statue. Simple black crosses mark the colony's first graveyard site beside the James River. Of the 500 settlers who arrived in Jamestown's first years, only 60 survived between 1607-1610. The Voorhees Archaearium Museum is located on the Historic Jamestowne property and showcases many of the archaeological artifacts discovered over the years. The exhibits, for the most part, were well done and very informative although I take exception to the human skeletons on display. At least, there were no photos allowed though I saw folks taking some. There was lots more to explore, but the wind whipped up and we were chilled to the bone. Besides, we still wanted the opportunity to visit the Yorktown Battlefield, only 20 miles away. 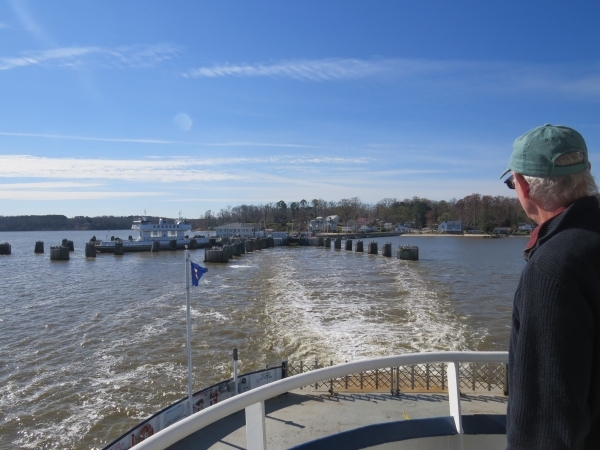 We took a quick 5-mile driving tour of the island, stopping to view some old gravestones and then headed off to Yorktown with the thought that we might visit Historic Jamestowne again when the weather warms up. Come with us for a visit to Yorktown later this week where the deciding battle of the Revolutionary War was fought. By the way, did you know that George Washington was 6'2”?